The Finally Farm team made the Kentucky bluegrass state a home away from home for two weeks during the Country Heir Horse Shows, held June 6-17 at the Kentucky Horse Park in Lexington. Finally Farm chose to attend Country Heir, in part, to give some of their horses an opportunity to experience the Kentucky Horse Park before the USHJA International Hunter Derby Championship and the Green Incentive Championship later this summer. In preparation, Clemens tackled the $30,000 USHJA International Hunter Derby during Week 2. After being a bit under the weather during Week 1, Clemens returned to the show ring and placed an impressive second. During Week 2, the Derby was held in the Walnut Ring rather than the Rolex Stadium, but Liza said it was still challenging for the horses, with big walls, impressive fences and use of the natural terrain. Liza and Clemens were tied for first after the Classic Round with Tim Maddrix aboard Indecision, but during the Handy Round Maddrix pulled ahead to win. 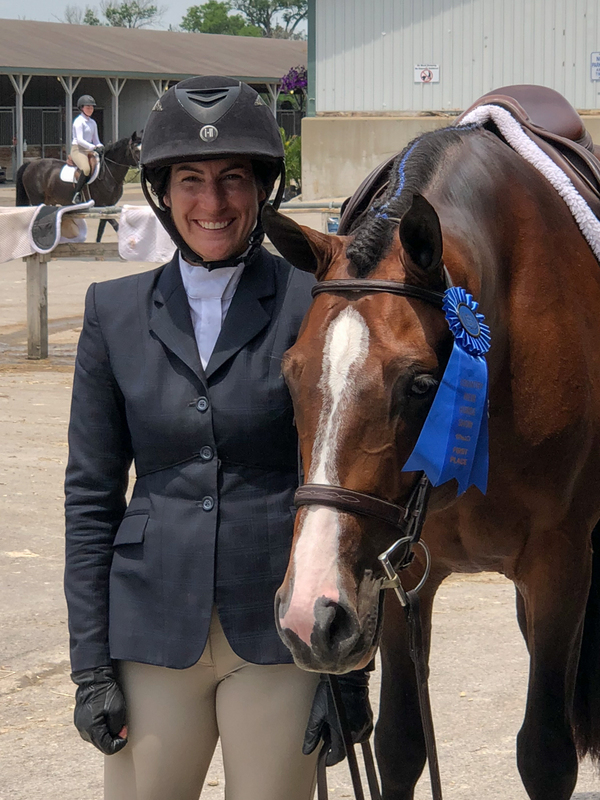 Country Heir also marked the first time Liza took Clemens in a 1.10m jumper class, which was the strategy she used over many years to prep her famous Brunello for the derby classes. Liza was also impressed with Clemens’ fortitude and confidence. He pulled a shoe after the first fence in the Classic Round but never missed a beat. Liza was also proud of her daughter, Elle, who made her debut in the Small Pony Hunters with Hershey’s Kiss. During Week 1, the pair scored an 87 for a well-earned blue ribbon, and they also won the Pony Hunter Classic. After shining at Devon in the Junior Hunters, Maggie Hill spent some valuable time in the Rolex Stadium in Kentucky gaining more experience in the jumpers aboard her new mount, Hope. “That mare is so lovely, and they’re trusting in each other and showing in these different environments,” said Liza. "They are really solidifying their partnership, and that's fantastic." Maggie also tied for the reserve championship in the Small Junior Hunters aboard O’Ryan and earned excellent ribbons with Cassanto, her Devon Large Junior champion, during the second week. In addition, Maggie was eighth in the USHJA National Hunter Derby in the Walnut Ring aboard Charmeur. Elly Ficca continued her winning streak aboard Cleopatra’s Smile, with reserve championship honors in the Junior Hunters. The pair also placed 12th in the USHJA International Hunter Derby. “I think she was the only junior to qualify for the Handy Round. She was just coming off of a confident Devon, and she sticking in there with good results!” said Liza. Bridget Hallman also collected her fair share of ribbons as a rider and owner. Her Halston showed just Week 2 and scored a 91 with Liza aboard in the Green Hunters. They also placed sixth in the $10,000 Joey Darby Memorial Green Hunter Challenge. “Halston is coming along nicely, and Bridget did so well herself. She won a class both weeks in the 3’6” Amateur-Owners on Gala. We also helped Daisy Farish, who scored an 89 in both rounds of WIHS and won that class riding Bridget’s Capitano. He’s a hunter turned equitation horse, and Heritage did a lovely job turning him into equitation horse this winter in Florida. He’s for a sale and ready to be a star in that ring," said Liza. Sisters Abbie and Lizzie Gordon also continued their successful summer show season. Libbie earned reserve championship honors on Small Romance in the Large Pony section and also won great ribbons on Shamrock in the Junior Hunters, scoring several 84s for second- and third-placed ribbons. Abbie was second in the Pony Hunter Classic the first week on Show Me Love and got nice ribbons in the Mediums both weeks in very competitive sections. Amy Nolan showed only during Week 2 but made it count, earning the reserve championship in the 3’3” Amateur-Owner Hunters with Caruba. Ellen Addison also received good ribbons aboard El Tiendo in the same section. Karen Lackinger’s Gratis produced consistent rounds in the very large and competitive 3’3” Green Hunter section and was ninth in the $10,000 Joey Darby Memorial Challenge with Liza in the irons. Congratulations also to Erin McGuire and Kasarr for placing second in the $8,000 NAL Low Amateur-Owner Jumper Classic. Posted on June 26, 2018 by Tricia Booker.